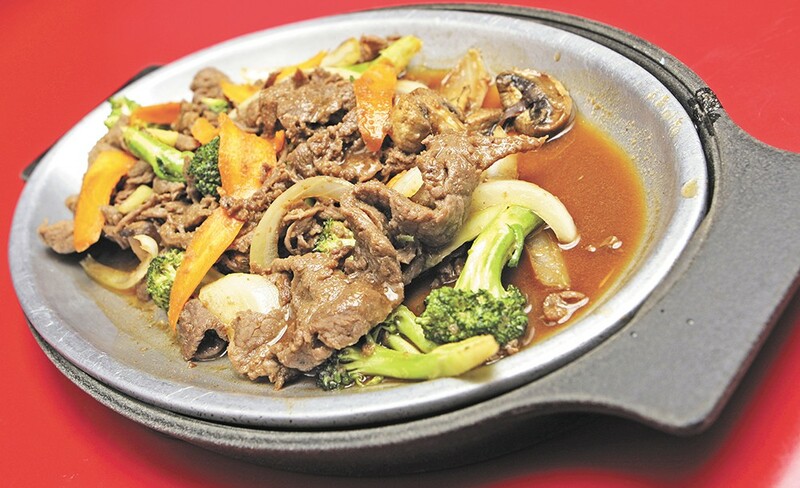 Bulgogi, a popular Korean dish, is a favorite at House of Seoul in Airway Heights. Though Korean food joined the local culinary scene later than most Asian cuisines, its popularity has swelled in recent years. Traditional Korean fare is based on rice, grilled, stir-fried and stewed meats, and fish and vegetables pickled and fermented as kimchi. Light sauces and preparations promote an overall healthy cuisine. On Highway 2 in Airway Heights, House of Seoul's enormous KOREAN FOOD sign beckons to weary and hungry commuters. Inside, server Jeannie Choi efficiently handles calls for takeout and to-go orders. 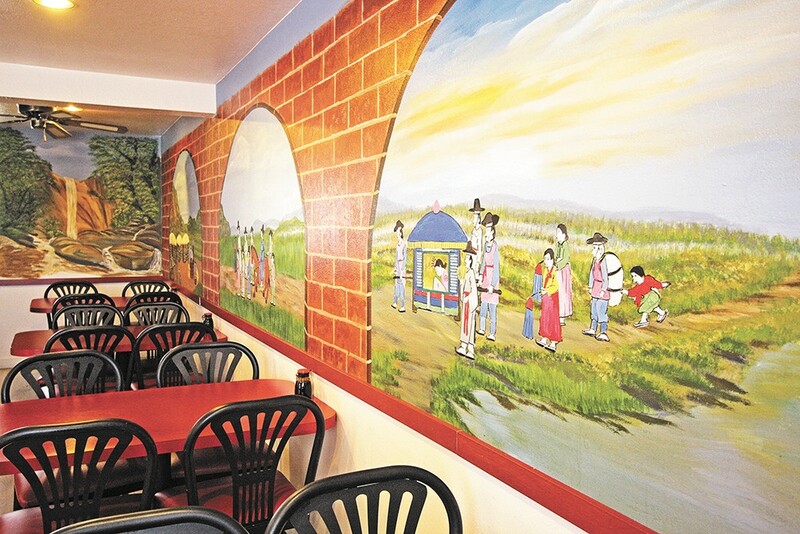 A Korean wedding mural looms over diners as they tuck into healthy and hearty Korean favorites. "Our food is totally healthy. All the kimchi is made in-house. Everything I make is fresh. The only deep-fried is yaki mandu. There is no MSG. Even the banchan are homemade daily. If there are leftovers, they're done," says chef and owner Bok Kim. House of Seoul's menu is vast, with traditional offerings as well as house specialties. Yaki mandu wontons are stuffed with shredded chicken and served with tangy soy scallion dipping sauce. Kim bap, the Korean take on sushi, is served warm and filled with rice, radish pickles, fish cake, cucumber and beef. Sweet potato chap chae noodles tossed with vegetables, beef, black pepper and sesame are a favorite of the younger set. In Korea, nose-to-tail cooking is common. Though House of Seoul offers tripe, the menu focuses less on organ meat and more on select cuts. A towering pile of perfectly grilled kalbi short ribs is savory and aromatic. Hot, spicy pork ribs are gingery, meaty and slightly sweet. Fiery kimchi jjigae, a classic stew consisting of pork, kimchi, noodles and tofu, arrives bubbling wildly in a stone pot and is not for the faint of heart. Guests are treated to complimentary banchan, small side dishes that accompany all main dishes. There are endless types of banchan, and House of Seoul features cucumber, cabbage, and daikon kimchi, sweet pressed fish cakes, broccoli in paprika mayonnaise, soybean sprouts in sesame oil, and shredded potatoes, to name a few. House of Seoul's traditional Korean murals. Choi and Kim have seen a steady increase in business over the years. "People come from all over... Spokane, Colville, even Canada. One guy from Texas comes here for the kalbi," says Kim. Chef Chong Lee Kim opened Kim's Korean Restaurant 12 years ago in a tiny storefront at the south end of Division near the Gonzaga campus. Though the traffic drones outside, inside, Kim's is homey and welcoming. Kim's handmade afghans line the chairs, and the quiet calm makes you feel as though you haven't left your own dining room. The broad menu and delectable food makes you glad you did. "This is home-cooked food, from the heart," says Kim. Kim's bibimbab is a flawlessly prepared and healthy combination of rice, shiitake mushrooms, steamed spinach, julienned zucchini and carrots, minced beef, daikon kimchi and cabbage, topped with seaweed bits and a perfectly fried soft egg. Gochuchang, a thick and spicy fermented soybean sauce, is served on the side. Though it may seem a tragedy to destroy such a beautiful presentation, the ritual of adding a dollop of gochuchang and wildly stirring the bibimbab to mix is part of the fun. Gorigomtang is unlike any other dish on the menu. This restorative soup showcases fall-off-the-bone oxtail in a thick bone broth dotted with scallions. Barbequed pike kkongchigui is served over a bed of cabbage and scallions with a tangy sauce. Popular jeyookbokkeum, a spicy and saucy stir-fry of squid and vegetables, has a cult following.